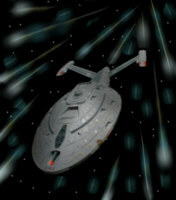 The U.S.S. Violator emerged from warp with a blaze of blurred motion as she phased back into normal space-time. Her main hull was that of an Intrepid class starship but her rear shuttle bay entrance had been widened slightly and a second bay had been fitted along her spine above the twin rear photon torpedo launchers. The second bay had been added by engineers to increase the otherwise pitiful load capacity of the design and after several Captains had taken command of the new ships and embarrassed themselves by ordering shuttles to dock in non-existent places. The powerful twin nacelles were supported with slender fixed pylons that jutted up from the rear at a shallow angle. Buried in the nose where the secondary navigational deflector once sat was a large pulse phaser cannon that jutted forward menacingly and the hull was littered with irregular plates of additional ablative armour with redundant replicators that could regenerate them in a heated battle. She banked hard towards her objective. Beneath her nose was a long tunnel that housed the newly fitted Quantum torpedo launcher binnacle, quite separate from the normal twin forward launchers. "I have Huttus 12 on long range scopes, they will be able to detect us soon with normal sensors." The operations chief stated flatly from his control booth at the rear of the bridge. "Bring the cloaking device online." Captain Faruqui instructed. The security chief Goruss Clogg brought the replicator grid in the forward section of the nose online. Deep in a hidden alcove the replicator generated a sophisticated cloaking device designed to bend light around the ship with a field of controlled gravitons. 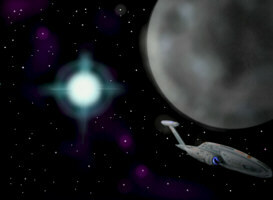 "How can a Starfleet vessel have a cloaking device?" Captain Graves asked from the rear of the bridge where he had been grudgingly included in the proceedings. "We don’t." Commander Brown replied evasively. "According to the Romulan treaty that would be illegal." "But you just said…" Graves stuttered, his reasoning floundering wildly. "We keep a pattern of a cloaking device of Federation design in the replicators. When we need it we generate it and dissolve it when we’re finished." She explained. "That way we don’t have one for anyone to scan or find if we ever get boarded." "It’s still illegal for the Federation to use them." Graves argued nervously, growing increasingly unsure of his ground. "They have to catch us first." Captain Faruqui sneered. "I would remind you that the technology you employ against Section 31 will be of great interest to them if they should ever become aware of it. It is in all of our interests to keep certain matters to ourselves…"
"I have completed preliminary scans of Huttus 12." The operations chief announced as his information appeared on the main viewer. "It is a type C moon in orbit around a gas giant of mostly hydrogen composition. It’s a binary system, three other moons in orbit, all ice planets except Huttus 12 which is essentially a gigantic solid rock." "Solid Rock?" The Captain repeated, turning his attention to the merchant. "They came here more times that any other world." Graves explained. "We were heading here when we were attacked." "Anything else in orbit of any value?" Commander Brown asked as she stood up to move closer to the main viewer. "Some trace metals in the bands around one of the other three planets. Nothing worth mining." "It was this moon!" Graves repeated forcefully. "We extrapolated the orbits with our computers to check their position and at the time the ships came and went they were heading for this moon!" "Your computers are hardly much better than counting on your fingers." Commander Brown pointed out coldly. "If you don’t mind me saying." "What kind of ships?" Captain Faruqui asked thoughtfully. "Mid-range cruisers." Graves glared back at her while he spoke. "Older warp signature and almost no Impulse that we could detect." "Perhaps a Miranda class?" Faruqui suggested. "We would have picked up thrusters too on our Bio-probes but we got nothing." "Perhaps an Aggressor?" Commander Brown suggested with a raised eyebrow. "My thinking exactly." He agreed. "Wait." Captain Graves stepped forward angrily before his assigned guard restrained him with a hand firmly placed on his shoulder. "You said we weren’t going to play this game any more." "Did I?" Captain Faruqui asked in a slightly mocking tone. "Actually it might be useful to have Mr. Compz up here to confirm our theories." "I’ll get him." Commander Brown nodded, stepping to one side and tapping her comm badge. "The Aggressor class was the first vessel Section 31 built. Before then they had borrowed or stolen ships to carry out their missions." Faruqui explained. "They’re basically Miranda components but with twin silent Impulse drives, a larger hanger bay to carry four attack shuttles and a few other important variations." The Turbolift doors swung open with the customary hiss as Haldo Compz blundered through with his ungainly limbs floundering around him in his usual casual manner. "You called?" He chirped happily. "What sort of vessels came here?" The Captain asked, stepping back from the main viewer. "Miranda class?" "No!" Compz shrugged. "The Deflector signature was more narrow and powerful, almost no radiation and the warp coils were completely dead when not at warp. The Core was completely screened and I didn’t detect any Impulse exhaust." "Aggressor class!" Captain Graves said with a knowing nod, enjoying the unfamiliar feeling of even slight superiority. "What?" Compz asked in surprise. "It pays to know your enemy…" Graves smiled smugly. "I want a complete scan of that moon…"
Commander Winston Morrow sat dolefully in the canteen sipping from an amazingly good cup of coffee. It was a well known fact that many of the replicator patterns interfered with each other and the engineers, when planning the basic menus often ended up programming things that were totally removed from what they were meant to be. It was seen as a useful morale builder on board ships as it gave the whole crew something to be united against when things were slow. The replicators on board the S.S. Wanderer could only make three things and two of them were toxic to humans and the other tasted like it should have been. He sipped again at the coffee and couldn’t help but to be impressed at the subtle perfection of the flavour. It was impressive to think that only moments before it had been a clot of biological human waste matter in the reclamation plant waiting to be rearranged at a molecular level. He didn't like to think about that too much as it had already put him off of ordering anything to eat. "May I join you?" A voice broke his meandering thoughts as he looked up to see where the voice might have come from. "Certainly." He replied, gesturing to an empty seat opposite to the young attractive officer dressed with blue uniform suggesting a science background. "Your friends are all up on the bridge." She said as she dropped her tray down in front of her. Morrow looked hungrily at the steaming plate of pasta. "Let them play at being spies." He shrugged. "To be honest I just want to go home." "Where’s home?" She asked with a smile. "Earth Moon." He grinned. "I can see Earth from my old mums house." "I was born in space." She sighed. "I’m always home…"
She watched him for a second, waiting for a response or some gesture that the conversation was indeed involving both of them. "Are you hungry?" She asked, noting his interest in her lunch. "Erm, yeah." He nodded. "I guess I am." "Over here." She waved at his security chaperone. "Guard, get this man some macaroni cheese number 56." The guard looked at her as if shocked by the suggestion that he should perform menial duties. He stepped forward a little unsure, knowing she outranked him but wondering if obeying the order was a derelection of duty. "They have to be good for something!" She smiled as he finally capitulated and headed off to the food replicator panel. "Winston Morrow…" He grinned, offering her his outstretched palm. "First officer of the Wanderer." "Katherine Rogers." She shook his hand warmly. "I clean the racks in the medical bay." "Oh." He muttered. "Maybe we should have shook hands after lunch." "Don’t worry." She assured him. "Only thing I’ve been toying with is your friends tissue samples and bio-probes." "He’s a smart guy." Winston nodded as a plate of steaming pasta was deposited in front of him by a surly security officer. "He seems to be." She agreed enthusiastically. "Ironically I don’t get to meet too many smart people working on an intelligence vessel." Winston smirked knowingly as he began investigating his lunch with a plastic fork. "They’re not so smart…" She huffed. "They’re self righteous and they struggle to adapt to new ideas." "Really?" He shrugged. "Not what I’ve heard." "A lot of stuff is kept hidden from view, especially with the Vulcans." She admitted as she chewed on her macaroni. "Like what?" Winston asked, his curiosity piqued. "Vulcan strength for instance!" She began, pointing her fork at him as she spoke. "They’re physically no stronger than Humans." "I’ve seen them." He shook his head and wrinkled his brow. "Psychologically human strength is limited by group consciousness." She explained, gesturing lazily with her fork. "Humans have learnt to be of a certain level to avoid injury or over exertion and the level is unconsciously agreed upon by the whole race but you see frequent cases where people exploit their full strength under an emotional impact that overwhelms the conditioning." "I’ve heard of that." He nodded, her statements seeming to make sense. "Well Vulcans have found way to overcome those psychological barriers so they can use their full potential whenever they wish." She turned her full attention back to her meal. "We will too, after centuries in space things are changing." "I see." Winston regarded her suspiciously. "Don’t even get me started on Mind-melds…"
"Enough to fool our sensors!" Captain Faruqui nodded. "I told you!" Graves announced triumphantly. "What we lack in sophisticated computers we make up for by not being you." Compz agreed cheerfully. "The moon is indeed riddled with a network of caves." Commander Brown continued, ignoring his comments. "Added to that it seems likely that they would employ a damping field to further confuse our scanners." "I would say that that goes without saying!" Compz sneered. "Sir." Security chief Goruss Clogg said sharply, his mouth tentacles vibrating madly. "I am detecting a vessel moving quickly on our position." "Scarab?" Captain Faruqui asked, spinning quickly to the tactical booth. "At least that’s something!" He grumbled. "Shield up, red alert, drop cloak, arm weapons systems." "We get to see a Section 31 starship!" Graves said happily, folding his arms over his chest. "I take it they’re no match for this ship?" "That remains to be seen." Commander Brown informed him, deflating him somewhat greatly. The vessel shot from the moon towards the Violator at full impulse power. The twin nacelles were mounted at the top of the ship, low to the hull to narrow the forward signature making a slightly harder target for anything that sought to fire on it. Her nose had a bulging array with brilliant glowing torpedo launcher and her belly had a deep undercut with a glowing deflector buried inside it. At her tail two impulse exhausts glowed dull yellow as the escaping gasses were passed through sophisticated cooling fans. The Violator turned to face her with its nose cannon glowing deeply red as it came slowly to life. "All weapons ready and target locked." Clogg reported. "Ion stream fired from deflector." "Ion stream?" Captain Graves shook his head, turning to face Compz. "In case they cloak, the hull would still disrupt the stream and they’d be able to track for a few extra seconds." Compz shrugged to the viewer where a blaze of shimmering white particles spewed from the deflector array towards the oncoming vessel. "And it does look pretty." "Red alert?" Morrow shrieked in more mortal fear of his life. "This just isn’t my day!" "I have to go." Katherine told him as she jumped up. "Battle stations, I’m a medic, I have duties." "Thanks for lunch." He called after her, wondering where he was meant to go. He watched for a few seconds as the dining area quickly emptied until he stood alone with his burly guardian and a flashing red beacon. "What about us?" He asked, turning to the guard. "If you’d like I could accompany you to your quarters so you could cower under your bedclothes." He suggested dryly. "I think the bridge." Winston suggested angrily. "I know you’re normally not allowed up there but I don’t mind leading the way." "You two stay out of the way!" Commander Brown said, pointing as rudely as she could at the two observers. "Fine with me." Compz agreed. "You know…" Captain Graves began, digging his balled fists into his sides and stepping forwards. "… I outrank you, young lady." He was met with a glare that reminded him of his mother, a woman who still sent shivers of fear down his spine thirty years after her death. "Just saying." He grumbled somewhat disgruntled. "They have locked weapons." Goruss Clogg reported. "They’re playing chicken." Captain Faruqui sneered. "Heading directly for us at maximum sub-warp with their weapons locked and knowing ours are too." "The question is, who’s going to fire first?" Commander Brown added, stepping down from the raised booth section at the rear of the bridge. "Time to impact?" "93 seconds." The operations manager answered. "We stand ready with all evasive patterns locked in." Helm reported. "Program to fire automatically when they reach 40 kilometres and bank hard to starboard at full Impulse." Captain Faruqui ordered, growing increasingly tense. The U.X. Saracen was bearing down quickly on the motionless Violator while she sat waiting calmly for her enemy to close in. The Saracen was unmarked except for her name and number in small letters across her saucer and a few warning badges for the benefit of her engineers. Most of her view ports were unlit as the crew was occupied with battle operations and she had little on board to support recreation in any case. "Closing." Security chief Clogg reported. "Program locked in and ready to execute." "Or be executed." Compz suggested. "Always the optimist." Captain Graves grinned without humour. "To him the glass is always about to be smashed into the face of somebody who least expects it." "They’re firing, sir." Clogg reported. "Two photons." "Hard to Starboard." Captain Faruqui ordered. "Evasive pattern Gamma 12. Return fire." "Full spread of torpedoes away." Clogg confirmed as the screen lit up with the hologram of five angry red blooms of fire streaking away towards the Saracen. 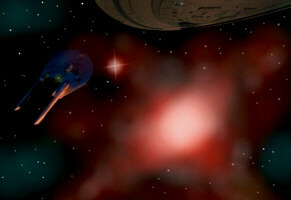 One of the two photon torpedoes skipped across the shield harmlessly as the Violator continued to roll out of their path. While the other detonated several kilometres ahead of her nose. The Saracen banked hard to port and instantly vanished in a blaze of blue as it went to warp. "Track them." Captain Faruqui barked. "Damage report." Commander Brown ordered over the sounds of alarms. "They’ve cloaked sir." Goruss Clogg reported as the scans showed nothing. "They detonated a torpedo in front of us to dispel our ion beam, we are unable to track them." "No damage." The ops chief called out. "The torpedoes were low yield, it was just a trick to cover their escape." "Damn!" Faruqui shouted. "Go to yellow alert and bring us into standard orbit of that moon." "Yes sir!" The comm officer agreed, navigating the massive ship with the simple touch of a few buttons. "That was obvious." Compz grinned from the rear of the bridge. "I’m surprised you fell for a trick like that." "I’m growing tired of you." He growled back menacingly. "One more word and I’ll have you escorted off the bridge." "Before you do, might I make a suggestion?" Compz asked politely. "Security, remove this man…" Faruqui barked, gesturing wildly. "They thought nothing of killing 20000 of my people to cover their tracks, if they’ve left they won’t have left without destroying what they’ve left." Compz shouted as a guard approached him, his hand twitching towards his pistol. "Wait." Captain Faruqui shouted more calmly. "Explain quickly." "They will have rigged this place to self destruct as soon as the last of their people is out." Compz said quickly, clearly not flustered by the threat of the guards. "They may have intended for you to pursue them in which case you may still have some time." "I need a full and detailed scan of the interior of that moon." Commander Brown called out, pointing to the operations chief. "I can’t get sensor beams past the mineral deposits. I could send in probes and recommend sending shuttles into the larger caves." He suggested. "Launch class 5X probes into the surface tunnels." She ordered. "Shame you don’t have any of those insurgence shuttles." Captain Graves shrugged. "I have four!" Faruqui told him sternly. The massive hanger doors at the back of the Violator rolled up into the support joist spilling light onto the landing marker pad. Two of the large upgraded and heavily armoured Runabouts flew out, one after the other. Their nacelles glowed a fierce blue from the broiling plasma churning away inside and a beam of blue light seared through space from the navigational deflectors added to the under side of their noses. They flew at maximum impulse towards the moon, their belly doors opening to deploy their full size torpedo launchers. Haldo Compz sat quietly behind the pilot of the insurgence shuttle, his eyes darted around the narrow cabin taking in every detail, noticing every reading on the consoles. He flicked his eyes up to the two massive transparent aluminium windows at the moon as it loomed closer, filling his field of view. "Are you sure you can diffuse anything we might find down there?" The pilot asked, leaning back from his command controls as he gently eased the craft towards the yawning mouth of a huge tunnel in the rocky face of the moon. "Yes." He said simply and without conceit. "I was raised on a colony where all we had was Section 31 technology, I know how they think as well as anyone." "That’s what you tell them." Winston Morrow added quietly from beside his old friend. "Truth is I have no idea what we’ll find." Compz admitted quietly. "It seemed as good a way as any to get down here and check the place out." Ensign Rogers stepped into the forward section from the tunnel that connected the rear lounge carrying a grey case embossed with the curled snake emblem of the medical profession. "Almost there." She sighed redundantly as she flopped down into the opposite bench from the merchant crewman. "Can’t wait." Morrow sighed, glancing up to the yawning chasm as the shuttle slipped inside. The cave suddenly lit up from the ships navigational lights as the craft gingerly made her way deep below the surface. "May I ask you a question, Mr. Morrow?" She asked cheerfully, opening her case on her lap to check the contents. "I don’t know." He replied grimly. "Last time someone asked me a question I ended up on a heavily armed shuttle going into a secret base to diffuse a doomsday bomb." "How about if I promise that things couldn’t get any worse if you answer this one." She smiled, checking her medical tricorder. "It could get much worse." Compz shrugged. "We’re just the support shuttle, the other one is loaded with troops ready for a firefight. This is a recipe for utter disaster." "Please shut up." Morrow said, leaning forward and hanging his head in his upturned hands. "Ask your questions please and then maybe he’ll shut up." "Probably not." Compz added nonchalantly. "I just want to know why you’re here." She asked, turning her attention from her tools. "All the officers here are doing their jobs, I was sent in case of injuries to the attack party, Compz has personal issues but what drives you to risk your life like this?" "Long story." Morrow sighed, sitting back heavily as if the weight of the world had fallen suddenly on his shoulders and was digging in with clawed feet. "3 minutes to airlock contact." The pilot reported as the craft picked her way along the narrow tunnel. "It seems we only have time for the abbreviated version." Katherine said softly, trying to coax him to continue. "I once attended the academy." He replied sadly. "Starfleet?" She asked with some small measure of surprise. "So did my sister." He nodded. "She vanished on special assignment, I never got an answer to what she was doing or what happened to her." "You never found out what happened?" She asked. "No." He shook his head sadly. "I joined Starfleet believing it was something wonderful. We all imagined that our future would be spent exploring space, reaching out into the universe and meeting new species to learn from, glorying in our differences and living for the journey." She nodded quietly, his words striking a chord inside her. "But it isn’t." He sighed. "It has dark secrets and hidden threats. What you see is one face but the Federation has others and when my sister vanished I lost my faith in it forever." "So you’re looking for her?" She asked softly. "I don’t know what I’m looking for." He snapped. "I just knew I wasn’t going to find it at Starfleet Academy." The lead Runabout drifted gently towards the end of the tunnel. It’s marker lights picked up a solid metal bulkhead with a circular indent of a standard Federation airlock surrounded by small docking clamps. The shuttle drifted to a halt and then rotated to come alongside the entrance before sending out tendrils of energy from the tactical sensors. The small ship drifted closer to the wall sending out a barrage of frequencies to trigger the docking arms. Suddenly with a whine of hydraulics and a jet of steam the airlock activated. The circular port began to slowly extend from the flat metallic surface to marry up with the airlock at the side of the Runabout cabin. "Red team have entered the complex." The pilot reported. "When do we dock?" Compz asked impatiently. "Red team have to declare the area safe." Katherine Rogers explained, slamming her case and taking a deep breath. "They lay down a series of sensors as they work their way in, when the risk of hostility is negligible we’ll go in and look for your doomsday device." "I suggest they get a move on." Morrow scowled as thoughts of the tunnel suddenly erupting in an anti-matter explosion filled his mind. Death was something he didn’t relish but somehow the thought of dying in an energy burst so quick and violent that he simply ceased to be chilled him to the bone. He shuddered nervously at the grim spectre of becoming instantly nothing. "Don’t worry…" Compz nudged him sharply in the ribs, his long nose twitching involuntarily from the smell of his friends nervousness. "I’m fine." Winston replied. He reached out to wipe an imaginary piece of lint from his grey-blue jacket and noticed his hand was visibly shaking. He quickly pulled his hand out of view and glanced about hoping nobody else had seen him. "We’re all a little nervous." Katherine assured him. Red leader Thomas Trenter pointed his phaser carbine down a silent tunnel. It was dark and barley lit except for a sickly yellow glow from phosphorescent plating that was designed to have a low energy signature making detection even more difficult. His carbine jutted out in front of him, designed purely for combat. It was short and finished in dull grey ceramic thermal-coating with the controls facing backwards in the targeting binnacle so the target couldn’t see the lights. The muzzle was a metal protrusion with two projection nozzles so the weapon could fire multiple beams at various settings. "Trenter to Red three." He said softly, pressing the comm button on the side of the earpiece. "Red three." The voice replied. "All clear, no movement." Trenter pointed his muzzle ahead as he traced his way swiftly and carefully along the short corridor towards a sealed entrance followed by two other troopers covering his advance. "Go!" He growled. Immediately the second trooper lurched forward and attached a sensor probe to the doorway and began entering settings on a modified tricorder. "Strange power signals sir." The officer reported. "Door locked with advanced fractal encryption algorithm and magnetically sealed. Force field running through the centre of the tritanium plates." "This is Red one." He began is he pressed the button on his ear. "I think we have what you’re looking for." "Confirmed." The reply buzzed into his earpiece. "Emergency procedure alpha." "Confirmed." He agreed before turning to his two men. "Alpha," he grunted, withdrawing from the sealed door a few steps. "Go!" Instantly the second trooper jumped back from the door leaving the sensor behind as the third man jumped forward with two long metal rods in his hand. As he moved into position three silver legs sprung out from the bases and the conical heads began to glow blue and hum slightly. "Pattern enhancers in position. Ready to receive Blue team." "Are we blue team?" Compz shrugged, looking around with amusement at the petrified face of Winston Morrow. "I thought you were on yellow team?" "Give him a break!" Ensign Rogers said flatly as they stood up and stepped quickly to the transporter pad. "We’re blue team!" Compz said cheerfully as they began to dissolve into a coherent matter stream. "Don’t you feel safer already?" "The door is sealed and we have very odd readings from inside." Thomas Trenter reported efficiently as he stepped back to let the team of experts get to the entrance and begin their incompetent tinkering. "Interesting." Compz enthused as he snatched up the tricorder. "What?" Katherine knelt down beside him. "This sensor probe is very unusual." He said, running his finger along the device attached to the door. "Focus please." Winston grumbled. "I’m very keen on not dying today." "Oh right." Compz smirked. "Not dying… right." "Can you get us in?" She asked, Morrows nervousness beginning to become infectious. "Withdraw the Red team." He instructed as he read through the tricorder data. "Go." She said, snapping her thumb towards the other end of the tunnel. "Guns make me nervous." Compz smiled as the disgruntled troops withdrew. "But you’re ok with ticking bombs?" Morrow leant heavily against the smooth metal wall, shaking slightly from a mixture of nerves and utter helplessness. "The door is sealed because there’s something in there they don’t want getting out." Compz explained. "Whenever there is any doubt about a project a door of this kind is fitted as a simple precaution.."
"They don’t want it getting out?" Winston asked, his interest aroused in the most negative way he could imagine. "Don’t worry." Compz assured him. "I’ve seen doors of this kind outside children’s play areas." "What about the strange readings?" Katherine asked. "I don’t know." He admitted. "I haven’t seen anything like it before. I would guess there’s some kind of biological material in there." "And they use that a lot in their technology?" She suggested thoughtfully. "They do." He nodded gravely. "It has proved to be an enduring and adaptable source of invention." "So how do we open the door?" Morrow asked, dreading that the answer wouldn’t be that they couldn’t and they should flee immediately. "Not as difficult as it might appear." Compz grinned, standing up from the sensor pad. "You just press the button…"
He reached out to a small black control pad fixed to the wall and as he pressed it a series of lights instantly illuminated. He touched the top yellow button and the door hissed quietly open. "You intelligence type are looking for everything to be more complicated than it sometimes is." He shrugged to the bemused expression on their faces. "We’re receiving a message from the surface, relayed from a probe." The comm officer aboard the Violator reported. "We’re being asked to move back and raise our shields." "Scan for another ship!" Captain Faruqui ordered. "Raise shields, red alert!" Commander Brown cried out, jumping up from her reports. "Nothing sir." The operations chief reported as his console lit up with sensor data. "A Scarab could be cloaked." He growled. "Flood the area with negative ions." "Sir!" Commander Brown pointed to the main viewer as the tactical scanners locked onto a small device materialising in space beyond the moon. "Magnify." He instructed, stepping forward towards the viewer. 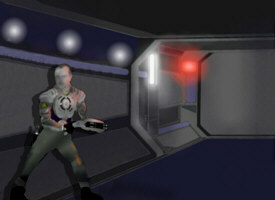 The image jumped forward to show a cylindrical object with a glowing red fusion generator at its base. "What is that?" Commander Brown asked, wrinkling her brow curiously. Suddenly the screen lit up brilliant white and the ship rocked violently from the blast. "Typical of the intelligence mind." Compz shrugged, waving around a small box of sensor circuits he had pulled from the door. "Build a fusion amplifier detonator and set to self destruct if the room is entered but not bother to protect it from being beamed into space." "So we’re safe?" Morrow shook visibly along the whole length of his body as rock from the man-made cavern crumbled from the blast of the bomb and fell to the floor. "We’re safe from the bomb." Compz shrugged. "We still don’t know what this door was trying to stop from getting out, and now the door is jammed open and we’re unarmed." "Oh god!" Morrow called out, covering his mouth with his hand as his stomach jumped in fear. "Speak for yourself." Katherine grumbled pulling out a small concealed phaser. "I thought medical staff chose not to be armed." Compz smiled but it concealed his disappointment. "If it’s going to be him or me…" She replied with a note of resolve while she set the flat little weapon to the highest level of stun it could manage without lobbing off large chunks of flesh, "…then it’s going to be him!" "We haven’t detected any people left here." Compz reminded her. "There are lots of members of Starfleet who don’t register as people on tricorders." She pointed out, glancing into the dim cavern while her eyes adjusted to the darkness. "Most of the them appear to be serving on your ship." Compz shrugged, his shiny black eyes being more accustomed to the darkness than humans. "Lights!" He called out as the sounds of Morrows stomach rejecting the macaroni cheese echoed around the chamber. The hall was instantly filled with light that picked out the huddled image of Winston Morrow kneeling behind them being violently sick. "Replicators!" Compz called out sympathetically, hoping to offer him a shred to cling to as the remains of his dignity trickled along the floor. "Yeah." He gasped, waving them away so he could compose himself. "What the hell is that?" Katherine called out, her phaser dropping limply to her side as she stepped into the cavern, overwhelmed by the surprise of what she had found.